A Blackjack Role-Playing Game? Hit Me. Proving once again that absolutely everything is better with careful application of hit points, magic and stat-based equipment, Sony Pictures Television's Suits And Swords is the more fun than a Blackjack game has any right to be. 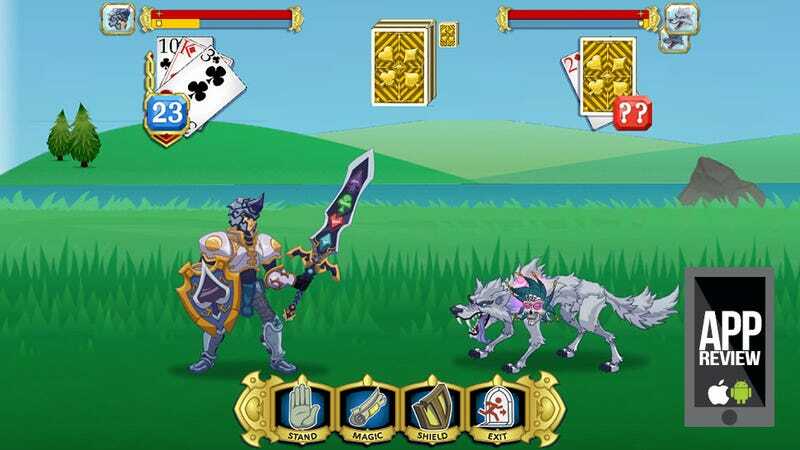 Remember iOS hit Sword & Poker, the hybrid role-playing/card game? Much like that series is the best way to play Poker on a mobile device, Suits and Swords is the best way to play Blackjack, unless you are one of those card game purists. The evil Joker has taken the four card realms captive, and only Captain Black Jack possesses the power to reclaim them. He does this by playing Blackjack, because that's just how things work here. The the idea is to get as close to 21 points as you can without going over. Win the hand, and you'll take a whack at your enemy's hit points. Double down or split for a chance at extra damage. Weapons and armor can be equipped for stat bonuses, adding hit points, magic power and damage boosts as the player sees fit. Magic cards give players the ability to add or trim points from both their own and their opponents' hands, while summoning cards call forth creatures who will take turns battling by your side, useful when the enemy starts ganging up on you. As role-playing game hybrids go, Suits and Swords is a wonderful combination of chance and strategy, statistics and swearing loudly. It's not the most polished offering — it has that amateur Flash game feel to it — but when the chips are down it delivers. Suits and Swords is available today on iTunes and the Amazon App Store, with a straight-up Android version coming soon. It's free-to-play, with the option to purchase gold in order to deck your character out in the best armor and equipment money can buy.